"The voice should be melodious and the language should be controlled. If we can control our tongue, 80% of collectivity we'll achieve. Tongue is, first of all, of course, for saying things, which are sweet and beautiful. Let us find out what sweet things we are going to say to people who come here. Not expressing our views about, 'I like it,' 'I like that,' 'I want that.' But on the contrary, 'Do you like this?' 'Do you like this? ', 'Would you enjoy this?' So the language should be directed towards others, showing interest and concern." 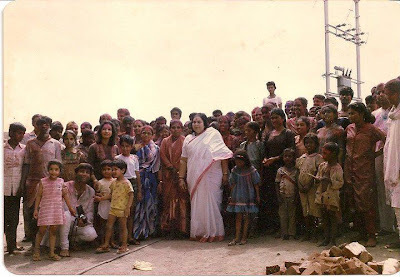 Shri Mataji Nirmala Devi - 2 May 1985, extract from talk about Nirananda, Vienna, Austria, Speaking on the topic of collectivity in Sahaja Yoga Meditation.